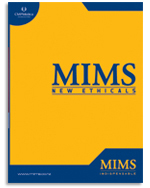 MIMS New Ethicals is the print solution to your New Zealand medicine information requirements. It includes access to MIMS Quick Reference, as well as a selection of therapeutic guidelines, manufacturer contact details and therapeutic class prescribing reminders. Pharmac and HML flags are included, as well as WADA drugs in sport information and ADEC pregnancy codes. Please let us know if you have recently changed your contact information (e.g., mailing address) and/ or would like to send in your feedback on MIMS New Ethicals. Click here to open the form. Please call or email MIMS Support Team on 0508 464 676 (+649 488 4285) to subscribe.